Contribute to Building a Culture of Empathy and Compassion. 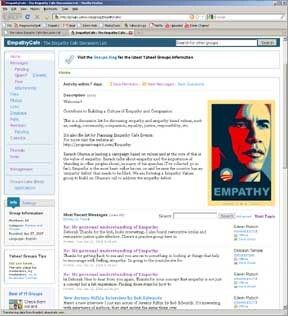 This is a discussion list for discussing all aspects of empathy and empathy based values, such as, caring, community, compassion, equality, justice, responsibility, etc. It's also the list for Planning Empathy Cafe Events. Controlling how you receive messages from the Discussion List. When you sign up, you'll have the option to select the way you want messages sent to you. You'll see something like the following options. You'll be able to select the option that works best for you. If you don't want to receive to many individual emails, choose the Daily Digest.